On Saturday afternoon at last February&apos;s Miami International Boat Show, amid the dozens of launches and parties I was obligated to attend, I was having lunch at an oceanside bistro when a commotion erupted nearby. Two couples were standing, bickering, and pointing towards the ocean. It seemed they couldn&apos;t agree on what kind of boat was racing across the horizon. 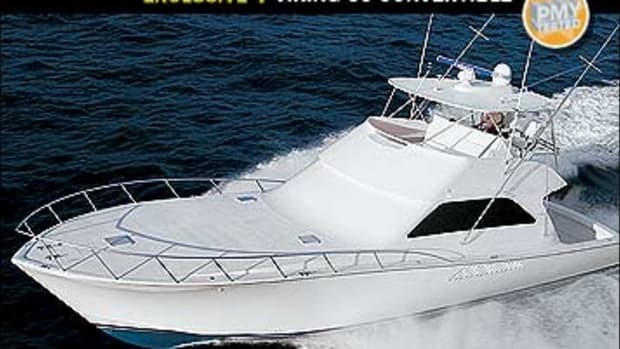 My curiosity was piqued, but sitting there with a nametag that identified me as a Power & Motoryacht editor, I didn&apos;t want to look like a blowhard, so I craned my neck somewhat stealthily toward said vessel. 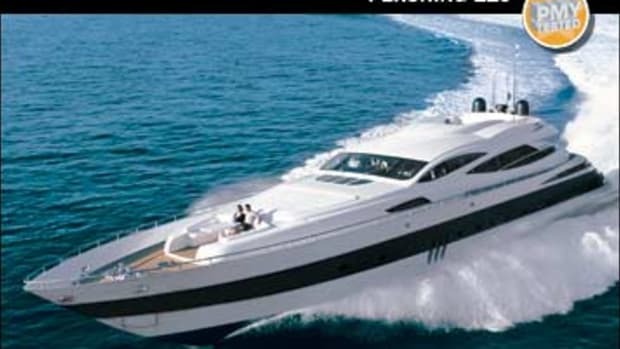 Although the boat was well offshore—it looked about the size of a Matchbox car if you were to hold it at arm&apos;s length—it was instantly obvious that it was a Pershing. Her trademark silver and white finish shimmered in the sun, set off by a broad, black stripe that accentuated her aggressive profile. Moreover, she was Arneson-equipped, shooting a roostertail high ino the cloudless sky. It was a sight to see, and many in the bistro agreed; a small crowd had gathered at the seaward railing, admiring her beauty. 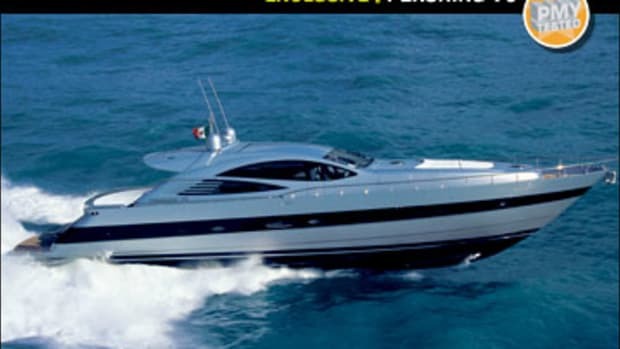 The boat oozed sexiness. 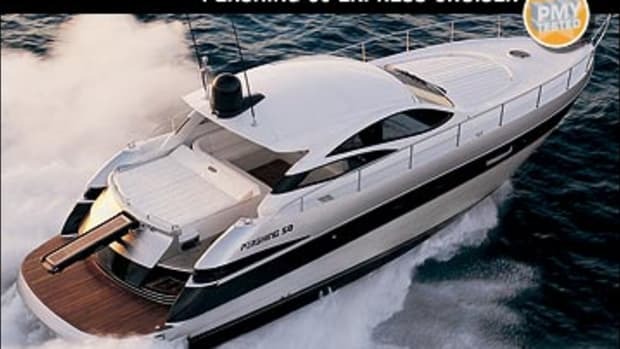 About a month later, I&apos;m standing on the docks at the Ferretti Group&apos;s Fort Lauderdale, Florida, headquarters among a throng of Pershings docked stern-to on the Stranahan River. 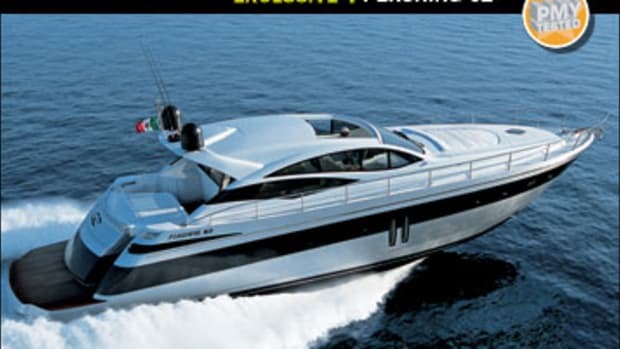 Pershing project manager Darren Datson is slated to join me on my sea trial of the Pershing 56, but I&apos;m early. 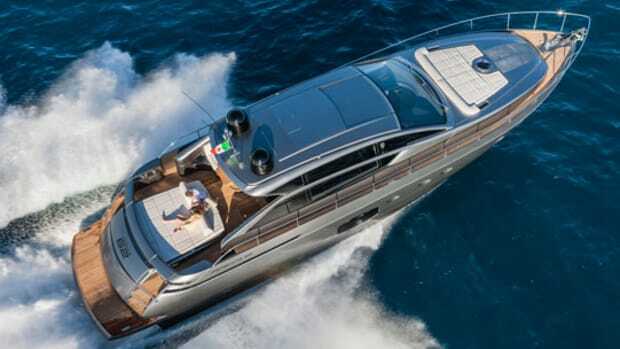 "Go ahead onboard and I&apos;ll be there soon," Datson tells me over the phone, and I take him up on the offer, keen on investigating whether the 56&apos;s interior is as striking as her exterior. It is. Boarding via the standard Besenzoni hydraulic passarelle, I make my way across the teak cockpit and below decks via a centerline companionway. I stand in the lower saloon and feel like I&apos;m in a SoHo apartment. The triumvirate of Pershing, Ferretti Group Engineering, and designer Fulvio de Simoni has merged clean lines with Japanese-influenced design cues to create a space that&apos;s understated but luxurious. Take her port-side galley. Stainless steel appliances, countertops, and backsplashes provide a cool counterpoint to pearwood cabinetry and a teak sole. The galley is open to the pearwood saloon directly across, ideal for entertaining, and a smoked-glass and stainless steel shoji screen slides across to enclose the galley and separate it from the saloon. The screen transforms the saloon: Closed, as many as eight guests can enjoy a private dinner at the L-shape settee, while the kids watch DVDs on the saloon&apos;s 36-inch LCD TV without disturbing the goings-on in the galley. I also like the galley&apos;s copious stowage. Cabinets above and below the countertop and a full-size Bosch refrigerator/freezer ensure enough ration space to satiate three couples over a four-day weekend, important considering the 56 sleeps six in her her master stateroom, VIP queen berth, and settee that converts into a double berth. Even if she&apos;s equipped with the optional third stateroom, the galley is still ready to feed all guests. As for that third stateroom, Pershing wisely made it optional on U.S. models, since although its starboard aft location wouldn&apos;t compromise the lines of the saloon, it would eliminate the stowage cabinet—complete with Pershing-logo crockery—on the aft bulkhead and cut into the master stateroom. And while it wouldn&apos;t reduce the size of the full-beam aft master, it would severely limit its stowage, which on my test boat was a fit-for-a-clotheshorse, 6&apos;3" long by 4&apos;3" wide, walk-in closet, with two built-in drawers roomy enough to hold a dozen pairs of Manolo Blahniks. 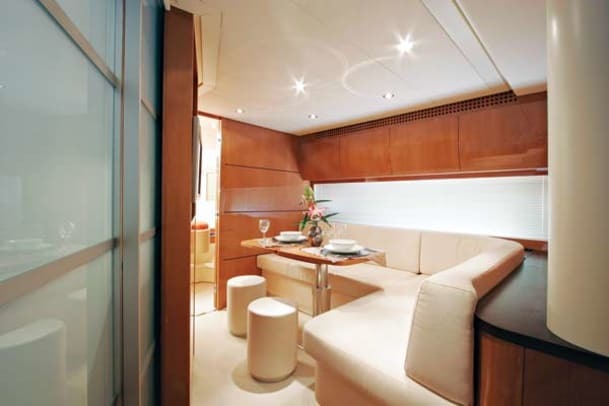 Strong Asian influences are here as well: A shoji screen like the galley&apos;s leads to an en suite head and diffuses light emanating from the windows, which are framed in wenge, a dark wood whose deep chocolate color blends well with the galley&apos;s orange sink and stateroom&apos;s light pearwood. Wenge is used in the stateroom&apos;s windows, the vanity countertop, and queen berth&apos;s nightstands as well. It just so happens that as I&apos;m on my way up to the cockpit, Datson is boarding. 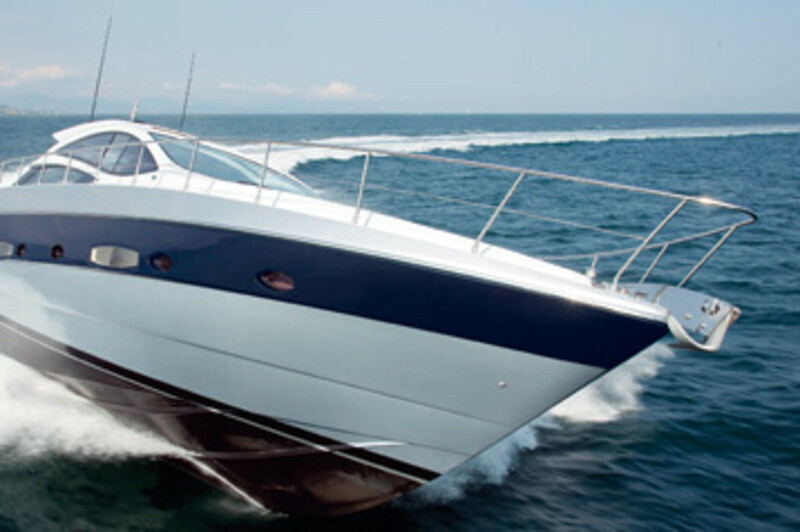 He quickly takes a seat at the starboard-side helm, starts the standard twin MAN V12s, and maneuvers the 56 away from the dock. Within minutes of clearing the inlet, we&apos;re blazing across a flat Atlantic at an average top speed of 57 mph. 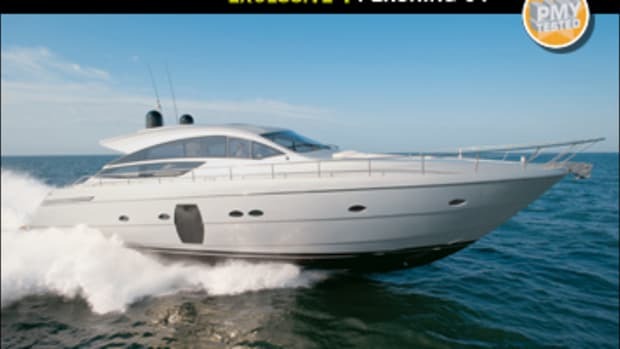 And just like that Pershing I saw off Miami, the 56&apos;s Arneson 12L drives are blowing a roostertail high off our stern. Datson slows her to idle, and we switch positions. Keeping my eye on the Arneson&apos;s trim indicators and the rpm readouts on the MAN displays, I start to raise the drives at about 1600 rpm, and the 56 jumps from under 15 mph to nearly 42 mph at 1750 rpm in an eye bat. 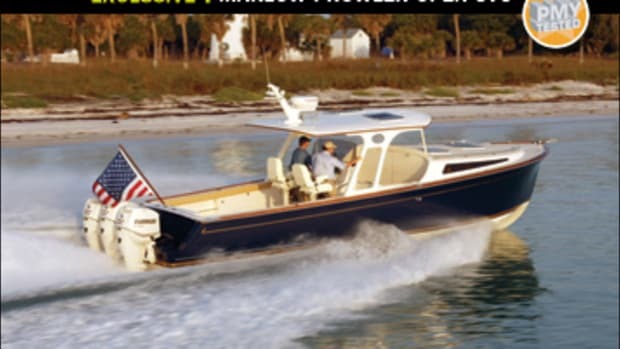 At 55.6 mph and 2200 rpm, she carves 180s in less than two boat lengths, generating sufficient Gs to land an oblivious passenger in the drink: The helmsman will want to warn his guests before he puts the 56 into a high-speed turn and be alert himself, as the sightlines in the opposite direction are pretty much obscured when the 56 heels over. 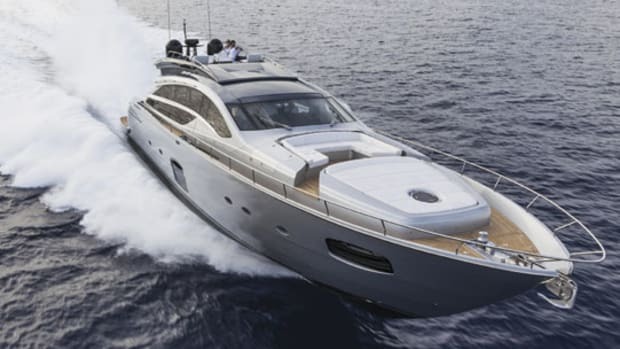 The Pershing 56 is obviously an exciting ride, but ultimately she succeeds because she delivers high style and blazing speed, qualities infused in Italian culture. But don&apos;t take my word for it. Consider an endorsement of a longtime Pershing owner, an Italian fellow whose wealth could have afforded him any vessel and whose surname has been synonymous with Italian speed and style since 1929: Ferrari.